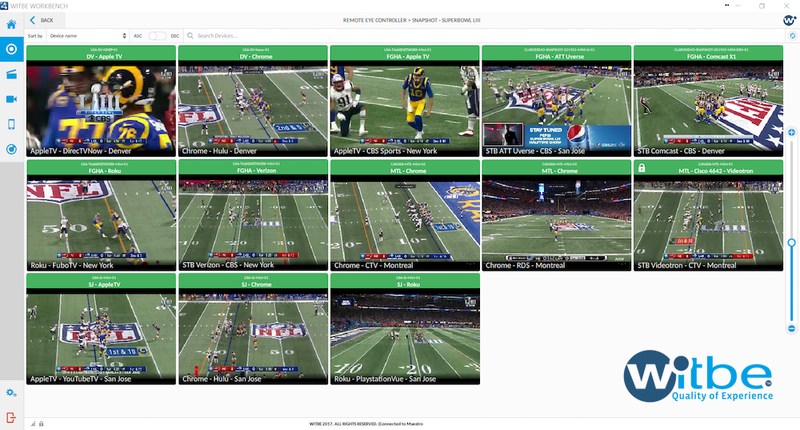 Witbe QoE Snapshot #4 – What Is The BEst way to watch Super Bowl LIII? 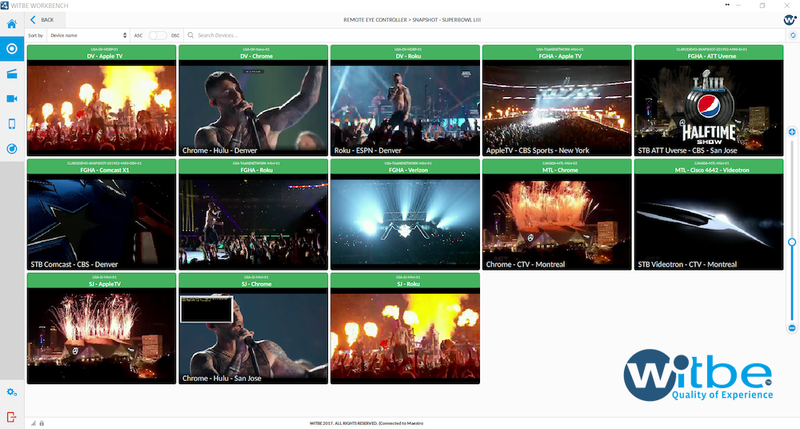 The most watched annual sporting event in the world deserved our biggest Snapshot set-up to date. 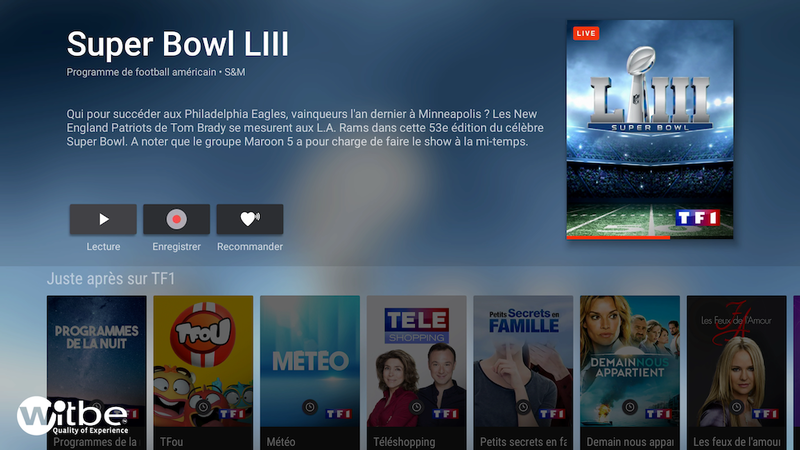 The idea was to provide a worldwide view on the Quality of Experience of the Super Bowl, across many different devices, channels and distribution networks. The environment for this Snapshot consisted of several Witbe “Video & Media” Robots hosted in 6 Witbe Offices across the world: Denver, London, Montreal, New York, Paris, and San Jose. 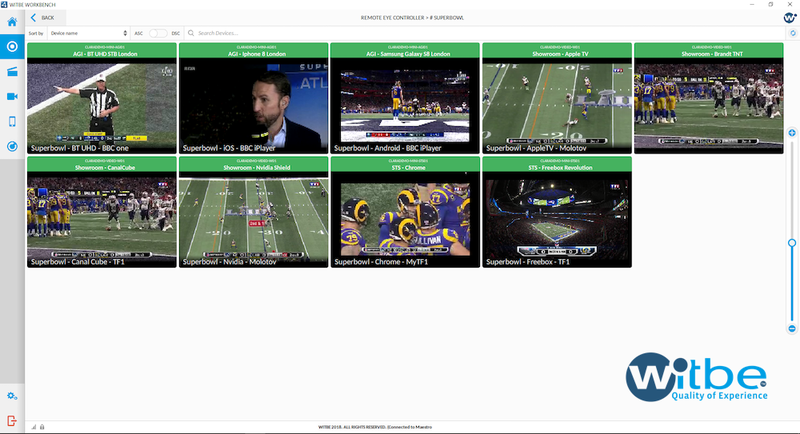 14 different devices, 8 apps (Watch ESPN, DirecTV, Molotov, Playstation Vue, MyTF1, Hulu, BBC iPlayer, YoutubeTV), and 7 TV channels (CBS, ESPN, CTV, RDS, TSN1, TF1, BBC) were tested through various delivery technologies (Cable, DVB-T, Fiber, IPTV, OTT, Satellite). The images above display these configurations in Witbe Remote Eye Controller, showing several streams on a single screen. The KPIs were measured every 5 to 10 minutes (depending on the test platform) on every 27 configurations, over the duration of the event (Sunday February 3rd 6:30pm to 10:10pm EST), for a total of more than 800 viewing sessions around the world. Every viewing sessions included a 2-minute Witbe VQ-MOS and VQ-ID analyses, representing more than 50 000 measured KPIs. All graphs and other visual representations of KPIs in this QoE Snapshot are generated with Witbe Datalab, our new restitution interface for fault finding, root cause analysis and advance analytics. The Super Bowl is traditionally watched on a TV screen. 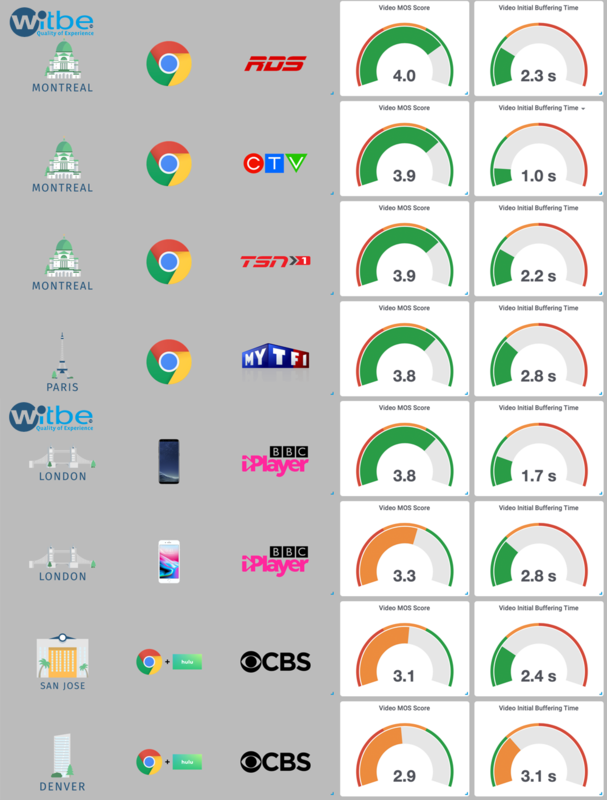 When looking at the “main screen devices” KPIs – especially the Witbe VQ-MOS score – we were surprised that OTT devices like Apple TV and Roku performed better on average than regular North American STBs. Based on our measurements, the best overall Quality of Experience was reached when watching the game on CBS on the DirecTV NOW app for Apple TV with the best Witbe VQ-MOS score (4.4/5), while also boasting the second-best Video Initial Buffering Time (2.1s). It is also interesting to note that the same channel, when played on the Verizon Fios STB, obtained the second-lowest Witbe VQ-MOS score (3.5/5). We also noted that OTT devices did not suffer from any significant delays in Video Initial Buffering Time during the game, even at the beginning or during the half-time show. 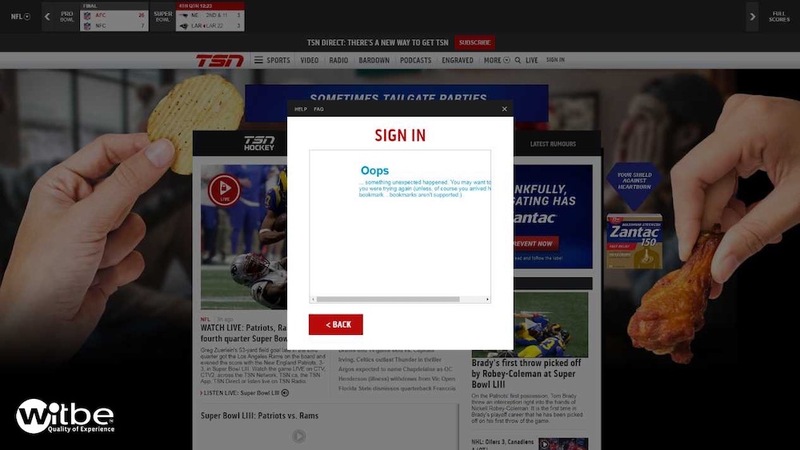 This can be explained by 2 factors: the OTT services were seemingly adequately sized to handle the load of the event, and most viewers were probably watching the game on traditional cable TV. However, when analyzing Video Initial Buffering Time in more details, we can see that the YoutubeTV app on Apple TV, as well as every tested Roku App (PlayStation Vue, Watch ESPN, and FuboTV), took noticeably longer to load the stream – the longest being FuboTV on Roku with a 17.3s loading time (more than 4x longer than the global average). When looking at the “secondary screen devices” KPIs, we can see that the Quality of Experience for viewing sessions on web and mobile was satisfying, even if it was on average lower than the “main screen devices”. Managing the streaming of a live event of this scale is a real technical prowess, it requires hundreds of people and a lot of effort and dedication. However, the Super Bowl is regularly prone to technical mishaps. In contrast, this problem was confirmed to be absent on MyTF1 in Paris and on ESPN Deportes in Denver. We can therefore infer that the root cause of this audio glitch was linked to the CBS live feed. The video above shows the audio drops the Robots detected (Witbe Robots record video traces for every test, in order to replay the scenario and understand what the Robot measured — this video was re-encoded and compressed). To measure major quality degradations, every viewing session included a 2-minute Witbe VQ-ID analysis, in addition to Witbe VQ-MOS. Witbe VQ-ID focuses on detecting severe quality deterioration events, such as macro blocking, video upscaling, frozen images or uniform screens, error or no broadcast frames, and even saturated audio or absence of sound. The alarms raised by Witbe VQ-ID are displayed in real-time in Witbe Remote Eye Controller, and integrated to Witbe Datalab to understand where major incidents happened. Witbe VQ-ID raised six 2-second and one 12-second “no sound” alarms. When investigating the cause of these alarms, we realized they were all associated to a black screen and that they all occurred during ads breaks. We deduced they happened because of a dynamic ad insertion issue, where the inserted ad was shorter than the allowed time frame. Considering the 5M$ price tag of a 30-second ad during the Super Bowl, dynamically inserting ads is something worth optimizing. This issue is similar to last year’s 30-second black screen. During Super Bowl LII, the black screen was also due to a problem with local ad insertion, as we mentioned on our blog at the time. The video above shows the 12-second black screen the Robot detected (Witbe Robots record video traces for every test, in order to replay the scenario and understand what the Robot measured — this video was re-encoded and compressed). From a technical perspective, the Super Bowl LIII went as good as one could have expected. No major downtime was detected by the Witbe Robots and the overall Quality of Experience was quite satisfying. Considering the scale of the event and the number of viewers, the technical teams in charge of streaming the event successfully handled the load, especially the teams working on OTT services. Even with all the machine learning algorithms our Witbe Robots come loaded with, the enjoyment of the game goes beyond the KPIs we measured. We are confident that the Patriots’ fans had a better time than the Rams’. Congratulations to the winning team! For more details about the results of this QoE Snapshot, don't hesitate to contact us! See you soon for the next Witbe QoE Snapshot! In the same way that a consumer report tests a product and publishes an analysis of its overall quality, the Witbe QoE Snapshots test digital services to make available to the market information on the true Quality of Experience delivered internationally. These QoE Snapshots should not serve as benchmarks, nor as rankings of operators by service, or by device. Rather, the goal of these QoE Snapshots is to provide a global overview of digital services, with multiple configurations and in various environments. The public will thus be able to better understand the technological complexity inherent to today’s services, like the distribution of video content. It is quite a technical feat – considering the efforts and means implemented – to broadcast videos on different devices and networks, with a quality that is acceptable by consumers with high expectations. Since its origin, Witbe relies on a non-intrusive technology, based on Robots measuring the quality truly delivered. The Witbe Robots are placed at the edge of distribution, and connected to test devices, the same ones as those used by real users. The Robots measure the Quality of Experience actually delivered to the end-users by providing KPIs on the availability, performance and integrity of the service. Each snapshot is composed of several analytical frames, highlighting interesting findings about the KPIs that were measured. In our last QoE Snapshot, we looked at who was the best mobile operator for video apps in Canada. This time, we published an analysis on the Quality of Experience of the most watched annual sporting event in the world: the Super Bowl!